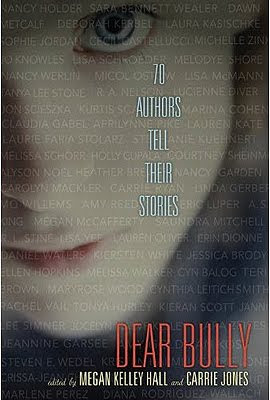 So as many of you know, I have an essay in the soon-to-be released anthology, Dear Bully: Seventy Authors Tell Their Stories (available for pre-order now!). In it I discuss my bullying experience from the sixth grade. As we gear up for the launch of this awesome book, edited by Megan Kelley Hall and Carrie Jones, I got to thinking about what it will be like to one day share these stories with my daughter—who’s currently 4 months old, and thankfully far from dealing with this. But still, I couldn’t help but say a silent prayer that she never, ever, experiences the taunts and friendship betrayals that I endured. So in an effort to get on top of things (I’m nothing if not efficient), I’ve decided to create a list of things I wish I knew when I was in middle school. 1. The cool girl with the awesome hair who’s allowed to wear makeup before everyone else and who all your classmates worship is 9 times out of 10 not a nice person. Don’t waste your time trying to please her. Find a real friend instead—it will save you a lot of stomach cramps. 2. Likewise, the cool guy who’s great at sports and who snaps girls’ bras and calls them names that make everyone laugh, is 10 times out of 10 a loser. When you go to your 10-year high school reunion, he will be fat and bald. 3. Someone willing to chase you around, call you names, and berate you in public (or these days, online), has a fundamentally flawed character. They’re weak and pathetic. You can’t change them, but you can stop what’s happening. Tell someone. 4. Don’t let anyone talk you into doing something you know is wrong. Enough said. 5. Your best friend is not always a friend. She should not make you feel bad about yourself and she should not be willing to “drop you” just because a cooler model comes along. Find a friendship that’s real and don’t base it on popularity, it will save you a lot of tears in the long run. Truly, I could go on like this forever, but the bottom line is almost every woman in America has been bullied at some point in her life. So know that we’ve all been through it, hopefully we’ve all gotten past it, but we’ve never forgotten it. Middle school is some of the hardest years of a girl’s life, so don’t let any adult belittle what you’re going through. It’s trench warfare out there. But it does get better. I promise. On a side note, DEAR BULLY made it into the NY Times Book Review this weekend. Check it out!